Eli Barsi with her first book, Poems and Paintings From a Prairie Girl. Poetry is nothing new to Eli Barsi. The Moosomin-based singer-songwriter has been penning lyrics since she was 12 years old with big dreams of one day sharing her music with the world. That dream has been realized. Barsi has made a career of travelling the globe performing her unique style of country-roots-gospel music to the delight of adoring audiences from Moosomin to Texas to Europe. But poetry for the sake of poetry, and painting for the sake of painting, are new to Barsi, and both are shared with readers in her first book, Poems and Paintings From a Prairie Girl, released March 11. Barsi says the book was a natural progression stemming from things she already loves. She started painting in earnest four years ago, and, as a songwriter, she was already used to writing poetry. 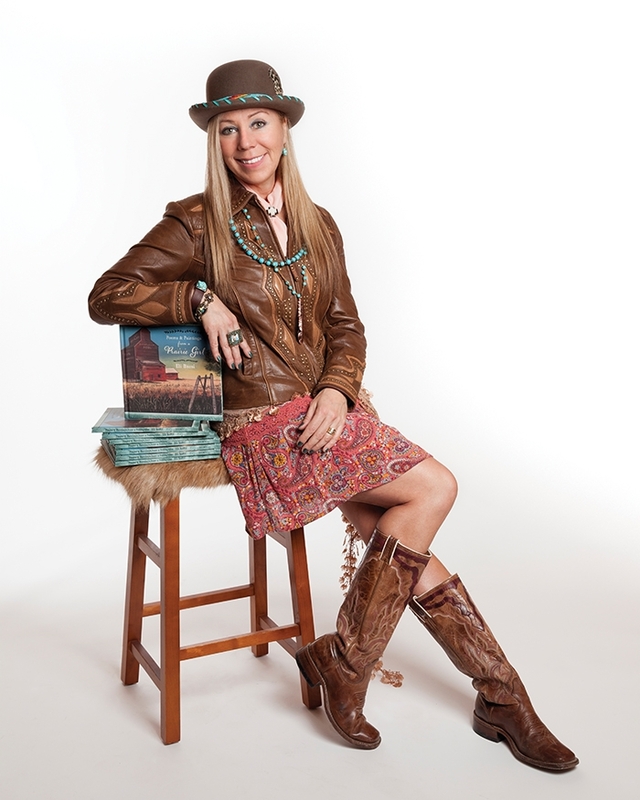 She put the two together and the result was Poems and Paintings From a Prairie Girl, a coffee-table-style book that is a blend of her poetry and her painting. “I’ve always been a poet, being a songwriter, but my poems were always written primarily to become a song,” she says. “So there are always words going around in my head. I had a lot of poems that were already songs and poems that weren’t songs yet, and then every piece of art that I do gets its picture taken. So I had all these photos of my work accumulating, and I thought it might be interesting to combine the two and to make a coffee table book for my first book, something that is a little more accessible to everybody and for a broader demographic, for all ages. “So I started the process and gathered a lot of things that I already had written, and then I wrote a lot more poems that are just poems for the book. Barsi started working on her book in October after coming back from performing on a tour of Europe. She says she has always loved painting, but because of her constant focus on her music, painting took a back seat in her life, until recently. “I painted when I was quite young in high school, and then I was so busy with the music,” she says. “It’s only been the last few years that I have tapped back into it—although every year for about the last 20 years the Kidney Foundation has asked me to paint for the Brush of Hope campaign, so I would do one painting a year, and I would always look so forward to it. But it was just the one. “So it was just the last few years that I started to tap into it and paint a few pictures, and I thought ‘Oh, I’m liking this.’ I like where it takes me when I paint. “I got a spot at the artist colony at Moose Mountain Park four years ago, and I’m going there again this year, but that’s what kind of got me started painting a whole bunch of paintings. I knew the size of the cabin, I didn’t want to go in there with just a handful, so I painted over 50 to be ready for that. I loved being there and people seemed to appreciate the art and I sold a lot of pieces, so it was a reason to keep going. And I started getting orders throughout the year. That’s continuing, getting some orders and some commissions and interest in paintings for different locations. What inspired Barsi to do a book combining photos of her paintings and poetry? “It’s something I haven’t seen before,” she says. “I always like to go in a little bit of a different direction and I haven’t seen this before. I’ve seen lots of poetry books. I’ve seen lots of books with people’s art—beautiful art—and I just thought the pairing of the two, and all from the same artist, would be interesting. Barsi says the book is meant to take people somewhere. “I hope it reaches them in some way. I put on the first page ‘what comes from the heart reaches the heart’ and that’s kind of the takeaway that I’d like people to get from it—whether an image takes them somewhere or the words of a poem reminds them of something. Barsi says she’s had a really good response to the book so far. “It’s been really great. Since the official launch last Monday (March 11) I’ve been mailing books every day somewhere. And then the ones that were already sold prior, they are kind of all over, all over the U.S., and since I was in Germany twice I’ve been getting some orders over there and sending them to Europe. The feedback’s been really great. “I just came back from a Texas tour and I had some at all the shows, and as many as I put out I would sell everywhere I went. I was very pleased. Barsi says there’s no mistaking that this book comes from someone living in Southeast Saskatchewan. “It touches on rural lifestyle. All the poems are real stories. It’s very heartfelt. It’s honest,” she says. “I think it paints some vivid pictures. This is Barsi’s first book but it probably won’t be her last. “It’s very exciting because it’s starting to open up some new doors and at this point in my career,” she says. “I’ll hopefully get to play music for a long, long time yet—however the market is changing so much and it’s saturated and there’s more artists, less work, so this has opened up a little bit of a different avenue. “You can only send your CDs to so many places to go in stores, whereas the book has opened up whole new options—it’s endless, from art galleries to libraries to gift shops to museums. It’s tapping into all of that, which is exciting and challenging and keeping me very, very busy already. “I’m doing special book tours where the focus is on the book, and I’ll read a lot of selections from the book and then do a few of the songs, just me and my guitar. And then I’m also going to have some art with me—four pieces of art—that will be a travelling silent auction. I’ll probably close that by the end of the year. The proceeds from the silent auction are going to go to the Canadian Mental Health Association (in honor of my sister). Barsi says she will be in the cities with her book tour and will try to arrange some local dates as well. She will be doing a book launch in Moosomin at Witch’s Brew Coffee House on Tuesday, May 7 at 7 pm. She says she would love to do another, similar book after this one. “There are so many more words inside of me, and paintings. I’ve already done another whole book’s worth. So it’s just a matter of pairing them,” she says. “It would be nice to have several volumes of this before I go on to something else. Because they will always be very different. You never know, people might want to collect them. It’s pretty early yet to tell.